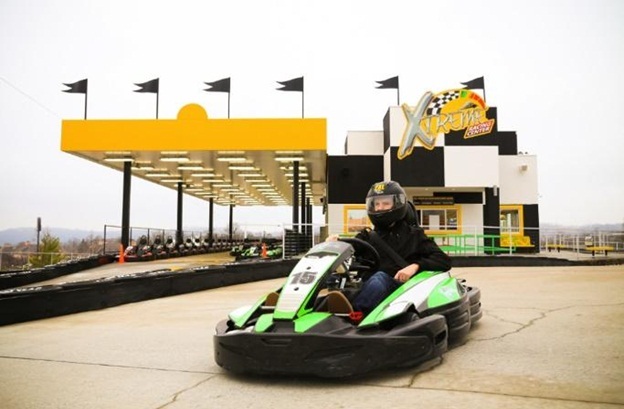 The Xtreme Racing Center in Branson is a great family fun park where you can ride with the fastest karts that travel at a speed of 30 mph while flying 50 feet in the air. In this sports facility, people of all ages can have the chance to experience state-of-the-art high-speed karts. This 3-million-dollar attraction in Branson features world-class Sodi karts from Nantes, France. In this racing center, you can race with the high performance racing karts in Branson, the longest road course in the country at 3,500 feet long. Xtreme Racing Center in Branson also features hottest arcade games. Racers who want to experience racing with the fastest karts in this family fun park in Branson, must be at least 51” tall for adult racers and 42” tall for kid racers. This fascinating fun park attraction in Branson has Pit Crew members who are ready to give instructions for safe riding and determine all racers’ ability in using pedals and steering wheel. Racers are required to wear closed-toed shoes to be allowed to drive the high-speed karts. Racers are also required to wear Balaclava head socks to be placed inside the helmets. You can get these socks at the ticket counter. Helmets are automatically provided but you can bring your own, but the Pit Crew members will check it for your safety. This high-speed kart racing facility offers racers racing packages to adults and kid racers. Adult Racing Package includes two races with Xtreme Racing License. Adult racer will race once with the center’s two high speed kart – The GT-5 (with speed of 30 mph) and the RT-8 (with speed of 40 mph). The age requirement for adult racers is 9 and up. The package for Kid Rider include two races also with Xtreme Racing License. Kid racer can race twice on the kids track with the Sodi Fun Kids Kart. Age requirement for kids is 5 to 8. While you wait your ride schedule, refresh yourself at Coldstone creamery or play video games to warm you up for the stimulating kart ride. Kart racing enthusiasts at the Xtreme Racing Center in Branson can have the chance to drive a World Champion Racing Kart at a speed of 30 mph. These racers can get their adrenaline rush once they ride the Sky Surfer. This kind of flying machine will leave you breathless as you surf the air close to 30 mph on a silver Sky Surfer. This motor-driven flying surfboard can be ridden three ways. When standing, you’ll feel an electrifying surfing experience on the air. When you lay down on your belly, you’ll feel like a super-hero, and when sitting in the padded seat, you’ll feel like flying in a magic carpet. The Sky Surfer truly offers a breathtaking flying experience. So, if you want to experience a thrilling and exhilarating ride of your life that will bring you 50 feet in the air at a speed of 30 mph, visit the Xtreme Racing Center in Branson.